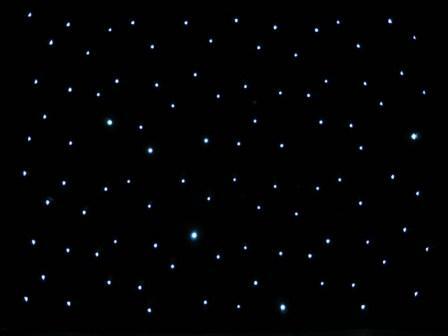 Professional LED Star Cloth which has over a 300 high intensity white LED's, mounted on a black flame retardant curtain. This star cloth is ideal for use in a theatre or arena. The cloth has hanging tabs on three sides and comes with a heavy duty carry bag. Supplied with control unit which has several built-in chase patterns, which can be sound activated, manually selected or controlled by standard 512 DMX control desk. (5-Channels).